Wyoming is home to extraordinary wildlife and intact ecosystems. These habitats and wildlife herds are unprecedented, including a wildlife migration that reaches nearly 250 miles. When speaking of the natural resources of Wyoming, our wildlife and intact habitat account for one of the largest economic drivers in the state, outdoor recreation. When something as important to our identity and economy as the Red Desert to Hoback Mule Deer Migration is at risk people should come out strong. Last week we learned the BLM is offering over 26,000 acres for lease in the southern end of the migration corridor. These leases will fall under 1997 stipulation in the Green River Management Plan. This 21 year old plan is outdated and doesn’t include new science such as the mapping tool/GIS identified migration. Currently, the new plan called the Rock Springs RMP, is being re-written with a final draft expected this fall. 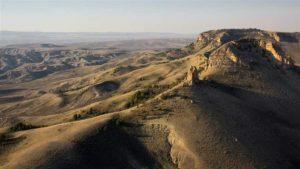 The plan would include up-to-date science, the Wyoming Game and Fish Department’s current Mule Deer Initiative, and any new Secretarial Orders from the Department of Interior. Currently, the administration is expediting oil and gas leasing to the point we will see over a million acres of new leases by the end of the year. This same administration has the ability to do the right thing, however, under their own rules. In February, they passed Secretarial Order 3362 Improving Habitat Quality in Western Big-Game Winter Range and Migration Corridors. The idea being the BLM will work with state agencies to enhance and improve the quality of big-game winter range and migration corridor habitat. The press release even features an image of deer in the Red Desert migration. Basically, it is a game of pickle, push hard for oil and gas development and protect crucial habitats. The problem is the DOI said push for oil and gas development first and has yet to give the BLM marching orders on protecting migrations. Maybe they should put the brakes on a bit and defer the leases in the migration corridor to enable the outdated plan to be revised and for the secretarial order to be implemented. We in Wyoming have a contingent of local government officials, sportsmen, business owners, and members of the public who can help give backing to those metaphorical brakes. On page 17 of the Wyoming Mule Deer Initiative it states, “WGFD will encourage the BLM to withdraw important mule deer habitats from consideration for oil/gas leasing and other industrial developments”. The Red Desert to Hoback Migration corridor – Wyoming’s only designated migration – should qualify as “important habitat”. We would like to see the WGFD ask for these leases to be deferred until the Rock Springs Resource Management Plan is complete this fall. Governor Matt Mead could also ask for these leases to be deferred, until the plan is done. The DOI would have time to consider how to implement their secretarial order on protecting big game migration. Governor Mead has had a strong conservation legacy in the high sage, both standing his ground on the state’s sage grouse plan and implementing strong methane rules in the Upper Green. Asking for protections for the countries longest migration, something unique to Wyoming, would seal his conservation legacy in his final days in office. Senators Enzi and Barasso could also make an ask to Sec. Zinke. A simple ask to defer these leases until the local plan is complete and the secretarial order can be implemented would go far with the people of Wyoming. In 2007, the Wyoming conservation community came together over 35,000 acres of oil and gas leases just east of Encampment. 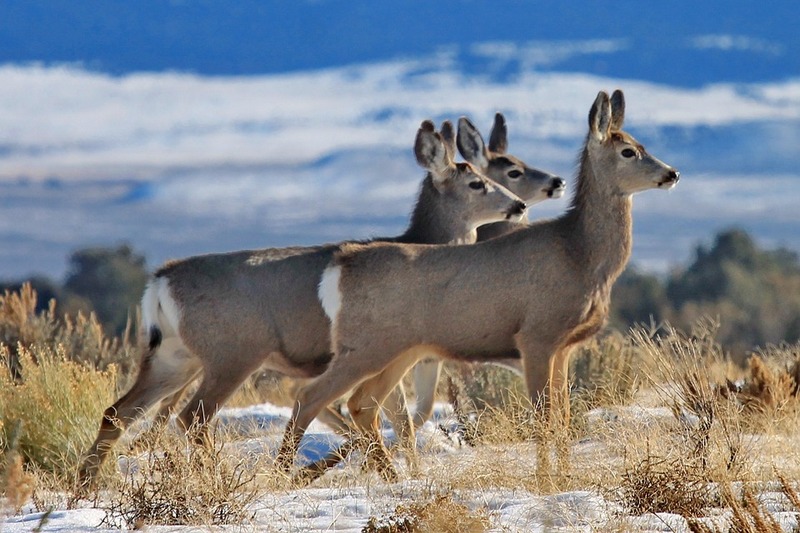 The leases sat directly in a mule deer migration and in crucial winter range. The effects of intensive drilling were a fresh wound. 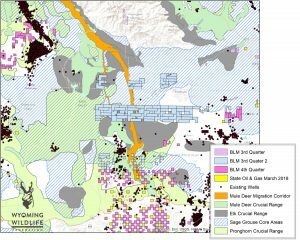 We had seen a reduction in 40% of the Sublette Herd, Atlantic Rim habitat was getting hammered with a quick money coalbed methane field, and the Hoback and Wyoming Range seemed next on the list. Sportsmen and conservationist pushed hard and the leases were withdrawn. How did this happen? The towns of Encampment and Saratoga, the Wyoming Game and Fish Commission, and Gov. Freudenthal all protested the leases. In total 88 groups, local people, and governments stood up and asked that the leases be pulled. It set precedence and left a legacy of conservation across the state. Following this was the Wyoming Range Legacy Act, protecting 1.2 million acres from oil and gas development. Solidifying the legacy of freshman senator Dr. John Barrasso as a conservation hero for Wyoming. The question is can we ride on the laurels of the past, without addressing the present. What better legacy than conserving the nation’s longest wildlife migration? Help is in protecting these unique ecological treasures.